Visiting from New York, Dona Oxford is an extraordinary, soulful and passionate singer, songwriter and keyboardist who's Old School, Soul vocals and her love of Rock & Roll piano infuses to create a unique sound many have compared to "Gladys Knight meets the Rolling Stones". This will be her only and final UK gig for the remainder of 2018. 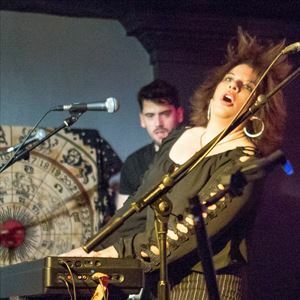 As a keyboardist, Dona has played with many Rock and Blues legends including Keith Richards, Van Morrison, Roger Daltry, Albert Lee, Buddy Guy, Bob Weir, Levon Helm, Son Seals, Hubert Sumlin, Julia Fordham, Harry Shearer, Judith Owen, Chris Farlowe, Andy Fairweather Low, Mike Berry, Shakin' Stevens, Steve Lukather, Leland Sklar, and her idol, the former Chuck Berry sideman and Father of Rock & Roll Piano, Mr. Johnnie Johnson! Known as the 'Goddess Of Soul, Blues & Boogie', Dona brings her sassy, soulful band throughout the world, touring over 22 countries and 48 States. In addition to recording 4 albums of her own, she also finds time to play on numerous Grammy and Handy winning albums and movie scores including the Eddie Murphy box office hit "Norbit", the Martin Lawrence film "Welcome Home Roscoe Jenkins" and the very funny Comedy Central favorite "Senior Skip Day". Dona's high energy, funky, groovy, gritty, and raucous sound will get the crowd on their feet and dancing in the aisles. Don't miss the artist that Golden Globe Nominee Ewan McGreggor said was "The next big thing in music!" "...Carole King meets The Rolling Stones"